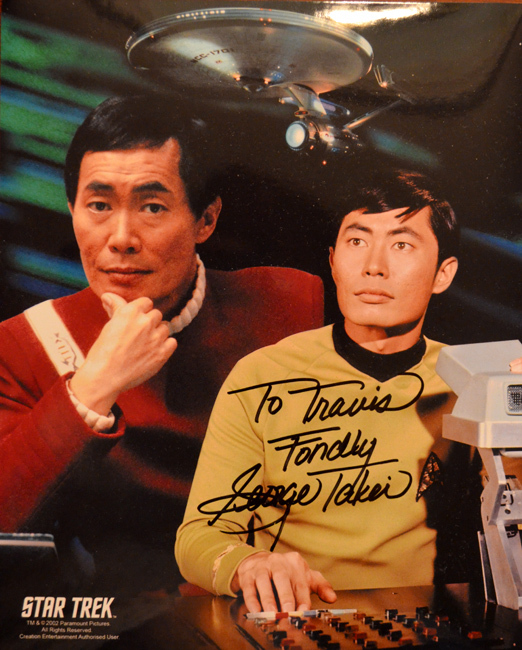 At the very top of my list of celebrities to see this year was George Takei, Sulu of Star Trek: The Original Series. Wow! What an incredible human being! The morning of the day I met him, I went to an hour-long panel session where he was the keynote. The session was moderated by Garrett Wang, another favorite actor of mine known for his role as Ensign Harry Kim of Star Trek: Voyager. Garrett does a brilliant, "Oh Myyyyyyy!" impression, so you can imagine the fun they had with that! George is funny, passionate about his activist work for gay rights and Japanese-American relations, he's incredibly active, he's so very grateful for the life he's lived and is living, he's compassionate, and he's hopeful for our future. I was in awe...and I'm eternally grateful for the opportunity to meet George. I knew envy would ensue when Tommy, one of the kindest people I've ever known and a dear friend who lives in Washington, DC, found out that Lindsay Wagner was going to be at Dragon*Con. So, it's needless to say that there was a lot of texting between us when hearing her keynote talk and getting to meet her. Lindsay is such a wonderfully sweet, kind-hearted, and grateful person. I know they're all actors, but I've learned over the years that at the Cons, you're really seeing the real person. I think they learn very early on that they can't fool fans...especially not fans of the caliber of Dragon*Con. I had the great opportunity to hear Lindsay speak on a solo panel, although in the Walk of Fame—where celebrities are gathered for autographs and photos—Lee Majors, The Six Million Dollar Man, was right there beside her. Very cool to see him, too. They grow them big in Canada! 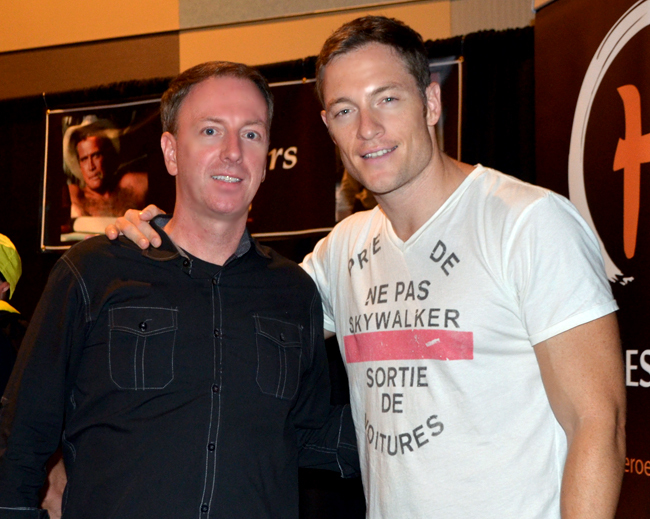 I was beyond star-struck to meet Tahmoh Penikett, who played "Helo" on the reboot of Battlestar Galactica. What a super nice guy, in a manly kind of way, and he happens to be Canadian. It amazes me how focused and attentive most of these actors are...they give each visitor their undivided attention and they hear what's being said. I wish I had that kind of focus and I really appreciate that actors like Tahmoh give it so generously. Battlestar Galactica was a favorite show of mine in the 1970s—I loved that show! Richard Hatch (Apollo) and Herbert Jefferson Jr. (Boomer) were there from the original Battlestar—and both were in the Dragon*Con Parade! From the new Battlestar Galactica—the BEST SHOW ON TELEVISION—were Tahmoh Penikett (Helo), Kandyse McClure (Dee), and Edward James Olmos (Adama). I look worse than star-struck in this photo...I look outright goofy. 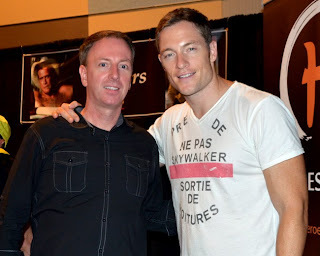 But, even for a brief moment, I was pals with Tahmoh, so I don't care how I looked...I do wish I had his arms though. 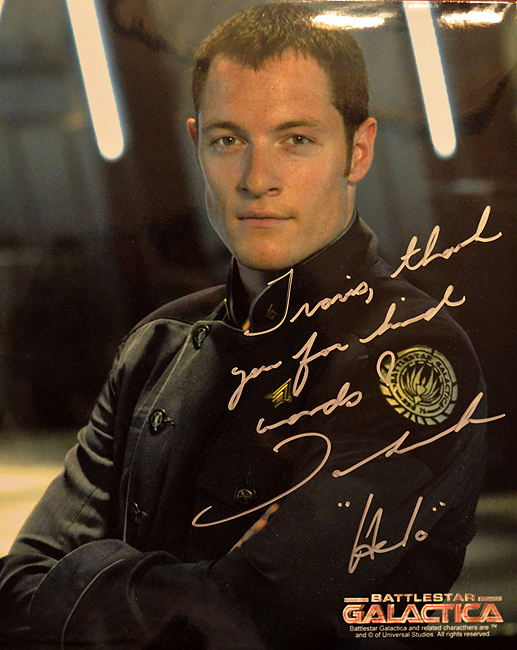 "Thank you, Tahmoh", for being so great with your fans! Those experiences really make the Con a fantastic and memorable event, at least for me they do. 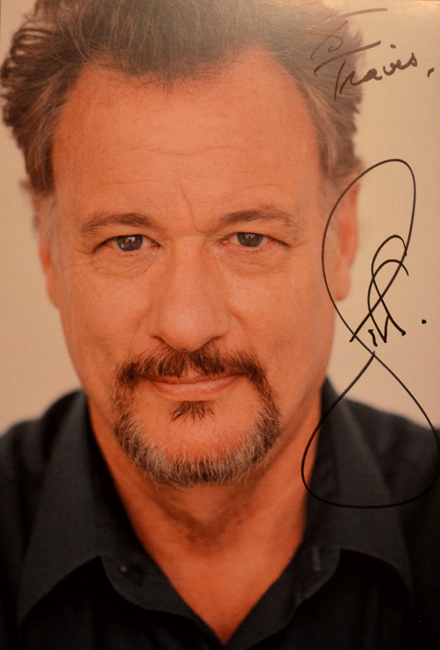 Meeting John de Lancie, who played the omnipotent "Q" on more than one television series of Star Trek, was a little more of a sterile experience. Perhaps it was a rough day. He comes across as incredibly smart—and he is a brilliant actor—but I didn't get the feeling that he was thrilled to be there. When I saw him fist-bump the person in front of me in line, I had a flashback to when I met Brent Spiner, and sure enough, it was a similar experience. That's not to say it was a bad experience...he's certainly a nice enough guy and I do love his "Q" character, so it was great to meet him. Have I saved the best for last? Well, let me just say that Terry Farrell, who played Jadzia Dax on Star Trek: Deep Space Nine, is even more beautiful in person than she is on television. And she's a beautiful human being on the inside, too! As a matter of fact, the first words out of my mouth when I met her were, "I'm sure you hear it all the time, but you're even more beautiful in person!" I really wanted to say something original, but her beauty demanded commenting. She told me that she doesn't hear that very often, to which I replied, "Well, you should!" What a sweet and charming person she is! I was beyond impressed with her warmth, her charm, and how she makes you feel like you're the only person in the room—when there are actually hundreds and hundreds of other people there. What a great experience it was to meet Terry Farrell. Also there this year from the Star Trek universe, in addition to George Takei, Garrett Wang, and John de Lancie, were William Shatner (Captain Kirk), Avery Brooks (Captain Sisko), Michael Dorn (Worf), Dominic Keating (Malcolm Reed), Cirroc Lofton (Jake Sisko), Brent Spiner (Data), and Marina Sirtis (Counselor Troi). I absolutely adore Marina Sirtis! She was the first celebrity I met at Dragon*Con back in 2010 and she made such a wonderful impression, that today I can't imagine missing the Con or any opportunity to meet celebrities I admire. "Thank you, Marina"...it's always great to see you. I would be remiss if I didn't note what was for me the biggest surprise of Dragon*Con 2013. In two words...William Shatner! For whatever reason, I had in my mind that he was miserable and a washed up has-been. That couldn't be farther from the truth. The man is brilliant! Brilliant, I tell you! If I hadn't already very quickly changed my mind when listening to him during his solo panel, it would have been when he answered a particular fan question—"What's a role that you wish you could have or still want to play that you haven't yet?" His answer is that there is no such role. He went on to express sincere and heartfelt gratitude for everything that got him to where he is...he shared his appreciation for his health, his family, his career, and for his fans. It was very moving. I left that hour of sharing, with a smile on my face and a warmer heart. "Thank you, Bill," for everything you've given entertainment, television, and cinema...I'll be a fan forever.